Cream and pink lampshade handmade in the UK. 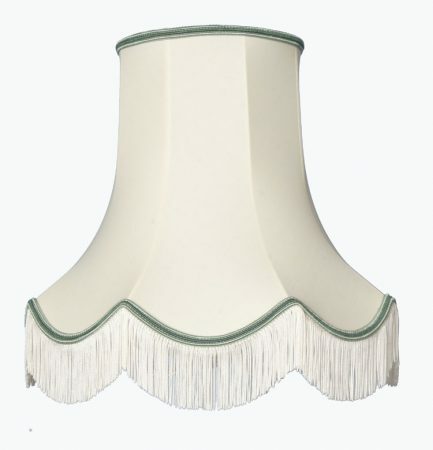 A classic quality handmade fabric lamp-shade made to sit on top of lamp bulbs for wall lights or ceiling light fittings. A traditionally styled clip on scallop design made with a cream fringe and pink braid trim. Please see additional image for colour braid options. These lampshades are handmade to order in the UK and will take approximately 2 – 4 weeks. Image illustrates Cream and Apple. Base diameter, 15cm, top diameter, 8cm. Height 18cm including the fringe.